Euphrasia collina subsp. muelleri R.Br. Description: Herb 20–35 cm high, branches usually forming near ground level, hairy with non-glandular hairs, usually in 2 decurrent lines. Leaves 6.5–11.5 cm long, 3–6 mm wide, margins usually with 2 or 3 pairs of teeth. Outer surface of calyx hairy. Bracts and outer surface of calyx hairy with non-glandular hairs. Corolla 9.5–13.5 mm long, purplish or lilac, with paler tube and lower lip behind lobes. 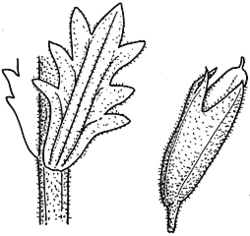 Distribution and occurrence: Grows in grassland and damp places, in the Dorrigo, upper Murray and Macintyre Rivers and in the Cootamundra area; possibly extinct in N.S.W.